After 25 years and 1,500 Thursdays, the Madres de Plaza de Mayo made a historic last march in Plaza de Mayo. The Pirámide, around which the Madres march every week, was covered with photos of the disappeared. In the year that is the 30th anniversary of the last military coup in Argentina, the final march by the Madres received surprisingly little news attention. While there were a good number of photographers in attendance, there were not the horde of videographers and photographers that seem to accompany every piquetero demonstration even though an announcement about the march had been on the Madres web site for at least two weeks. There was an almost circus-like atmosphere to this Thursday’s event that, I thought, detracted from the solemnity of the regular weekly marches. Two stages of live music, food stalls, and a number of piquetero groups staked out spots on the Plaza. Yet, appropriately for this last march, the presence of the piqueteros ensured that this time there were more Argentines than foreign tourists in the Plaza with the Madres. According to Clarín, however, there will still be Madres marching in the Plaza de Mayo on Thursdays. Foreigners often don’t learn that there are several groups of mothers associated with the Plaza de Mayo and the disappeared. The largest and most well-known is the Asociación Madres de Plaza de Mayo, headed by the outspoken, and sometimes controversial, Hebe de Bonafini. It was this group that ended its weekly marches. A splinter group is the Madres de Plaza de Mayo – Linea Fundadora, which separated from the original group in 1986; this group marches at the same time as the original group but does so separately and under its own banner. Bonafini gave some odd statements explaining the end of the marches was because they do not have an enemy in the Casa Rosada and that “El presidente es amigo de Madres”. Technically, the Madres have called these marches “la Marcha de la Resistencia” and it is the march of the resistance by the Madres that is ending. Clarín reports that the Linea Fundadora will continue with its “Marcha de la Resistencia” on Thursdays. Also, it seems that the Madres led by Bonafini will continue marching on Thursday about the disappeared. At first when my children disappeared I just laid down in bed, looking at the ceiling, blank. That was all I could do. My weight went down to forty kilos….I met a woman who said to me: “Why don’t you come on Thursday to the Plaza de Mayo? Take a little nail, that is how they will recognize you.” So I went, and I sat on a bench and my husband sat a little away from me. I had this little nail in my hand, and I saw that the others also had a little nail, and that is how I knew it was them….In the Plaza we secretly passed notes about where our meetings would be….We were simply housewives. Most of us had never done anything outside the home. 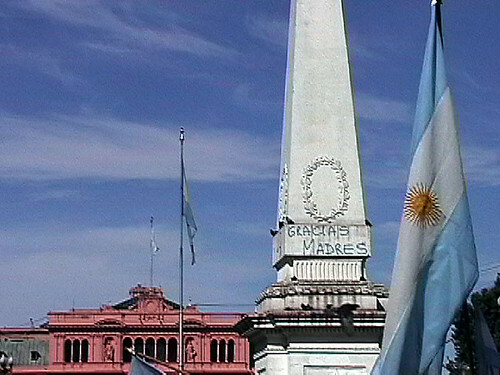 I first saw the Madres in Plaza de Mayo in early March of 2003 on my first visit to Buenos Aires. After they finished their half-hour demonstration in the Plaza, we followed the Madres as they made their way to a statue in front of the Casa Rosada. The Madres walked up onto the base of the statue to give a speech. Later I learned that the speech was a regular part of the Madres’ Thursday ritual. Normally, the speech is given by Hebe de Bonafini but she wasn’t there that day. Instead, it was given by one of the other prominent Madres. This was only a couple of weeks before the U.S. invaded Iraq but it was clear that war was coming. The Madres spoke out passionately against war, stressing that it is the mothers and the children who suffer the most during war. In reading books about the last military government in Argentina, it’s chilling to come across statements in which the government labeled the disappeared as terrorists and justified its oppressive actions as means of combating terrorism. Groups like the Madres are needed to serve as a reminder, not only to Argentina but also to the world, of the atrocities that can be committed by governments in the name of patriotism. Leaving the Plaza that day in March 2003, walking down Avenida de Mayo, I looked back and took a photograph that always will be my most emblematic memory of Buenos Aires. The Plaza’s centerpiece, the Pirámide de Mayo, is often covered with graffiti and contiually repainted white by the government. On that particular day it was adorned with the simple words, “Gracias Madres”. On New Year’s Day we went with our friends Ceci and Nestor to Tigre, the fascinating Paraná river delta that flows into the Rio de la Plata. Tigre itself is a small town but the name also refers to the vast waterways throughout the delta where many residents of Buenos Aires have second homes. Scattered across hundreds of small islands, the only way to access the interior is by boat. Most of the residents have a boat that they keep in dry storage when not visiting the islands. During the thirty or so minute boat ride we passed a number of homes that range in size and quality. Some are very nice, practically luxurious, others are simple and pleasant and then there are those like Nestor’s: primitive and without electricity. But, somehow, it fits a fifty-something photographer who drives a classic Citroen. (The house in the photo is not Nestor’s but the nicer one next door). Of course, electricity isn’t needed for a great asado and it was an interesting experience. While relaxing in a hammock next to the stream that runs in front of the house I had the chance to finish reading a story by Bioy Casares, “De la forma del mundo”. The story is set in Tigre and, ostensibly, is about a secret tunnel on one of the islands in the delta that provides a five-minute shortcut to Punta del Este, which is a resort almost 400km away on the far coast of Uruguay. Incidentally, Punta del Este is where many of the pretentious set from Buenos Aires are currently basking in the sun. (Having lived in South Beach I’ve had enough of that). Back to Bioy’s story: the young narrator named Correa is shown the tunnel by a mysterious dentist that he met on the ferry to Tigre. The story is set in 1951 and there’s a subplot of smuggling goods from Uruguay to Argentina. I learned through the story that Perón had banned travel to Uruguay, something which I didn’t know before. The story revolves around the possible untruths between the narrator and the dentist, and then among others later in the story. Correa meets Cecilia, a woman in Punta del Este who is very sad over a husband who had deceived her and left her for a younger woman. Cecilia begins to fall in love with Correa, who tells her about the tunnel. Correa doesn’t understand Cecilia’s lack of fascination over the tunnel or why she then says to him, “Por más que te acompañe, un mentiroso te deja sola.” [ “No matter how good a companion he is, you’re always alone with a liar.”, tr. SL Levine]. The nickname of the narrator is “el Geógrafo” [the Geographer]. Allusions to mapmaking and how once firm notions turn out to be false, such as the world is flat, are never far from the surface of Bioy’s story. Building to a suspenseful ending, “De la forma del mundo” ultimately becomes an examination of lies, beliefs about the truth, and the validity of knowledge that is passed from one person to another. I’m often asked by tourists for a list of things to do in Buenos Aires. So, here’s my list of things tourists should try to do while visiting Buenos Aires. Most of these also can be found in any guidebook to the city but I listed the things I liked. It’s ordered in no particular manner. Some items could have been collapsed into a single entry or expanded into multiple ones. Originally written in January 2006. Check current guidebooks for updated times and prices. 1. San Telmo: On a Sunday morning San Telmo sometimes seems close to being a tourist trap but the antique fair and the atmosphere still make it worth a visit. I live in San Telmo and if you want to avoid the crowds then come on a weekday. The fair is only on Sundays but San Telmo is worth wandering around on any day of the week. Some of the restaurants around the plaza are overpriced and not very good but stop in at Bar Dorrego on Defensa for a snack. 2. Recoleta Cemetery: Must be one of the great cemeteries of the world. Fascinating to wander among the tombs. 3. Teatro Colón: The city’s great opera house. Performances are relatively inexpensive but if you’re not into opera or classical music then, at least, take a tour which will show you not only the beautiful auditorium but take you backstage. 4. Tango at the Ideal: I don’t dance and I’m not a fan of the fancy tango shows for tourists but I do enjoy watching others dance, particularly ordinary people. The Ideal is one of those old style places with tango dancing on the upper floor. In the afternoons, after the tango lessons, the place will be filled with a mostly older crowd. Even if you don’t go for the dancing, the Ideal is a gorgeous place to eat or have coffee. 5. 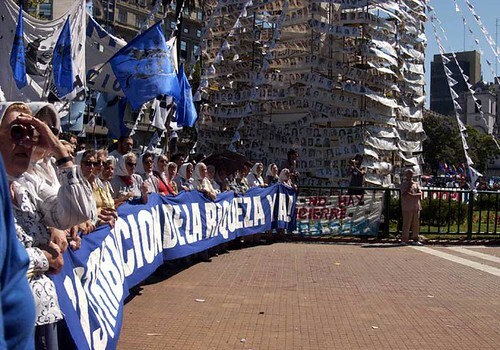 Madres de Plaza de Mayo: Thursday afternoons at 3:30, the mothers of the disappeared still march every week inthe plaza. After their march, which lasts thirty minutes, the madres gather in front of the Casa Rosada for a short speech. It’s worth staying and listening. 6. Café Tortoni: the oldest and most beautiful of the cafés in the city. Mostly a tourist spot now but still worth the visit. 7. Plaza San Martín: a nice shady area in the heart of the city. Plenty to see and do around there so the plaza makes for a nice place to take a break. Go up to the top of the English Tower for great views and then take a look inside the old train station. Borges lived just a few steps from the plaza. 8. Stroll down calle Florida: not the best shopping and you’re likely to be hounded by touts trying to sell you leather jackets or other overpriced goods but the pedestrian street still has an energetic appeal to it. There are some great buildings in the area. An easy one to explore, since it’s a shopping mall, is Galería Pacifico; the top floor is a cultural center that usually has very good exhibitions. If you’re hungry then the Richmond is an interesting place to stop; it’s one of the places that Borges frequented. 9. La Boca: Oddly, it’s one of the least desirable neighborhoods in town but it’s also the most touristy. Actually, it’s only one small area of Boca that has found its way into practically every book’s photograph of Buenos Aires. I do think that the picturesque small street of Caminito is a tourist trap (and the tour buses lined up there seem to prove it). The colorful street was the idea of artist Quinquela Martin, whose paintings I think are superb. His nearby house and studio are now a museum of his works and should definitely be visited. 10. Fútbol! While we’re talking about Boca, if you’re a football fan (or soccer to those in the US) then a game at Boca is a must. If you’re not a fan of the sport, then you can probably skip this one though it’s still an interesting experience. 11. El Ateneo: Simply one of the most incredible bookstores in the world. Located at Av Santa Fe 1860 in a splendidly restored old theater. 12. Manzana de las Luces: historic tunnels under 18th century Jesuit buildings. 13. Palacio San Martín: Only a hundred years old but once a massive home for one of Argentina’s wealthiest families. Guided visits on Thursday and Fridays. 14. Museo de Arte Hispanoamericano Isaac Fernándex Blanco: nice small collection of Spanish-American art in a lovely neocolonial house. 15. Plaza Carlos Pellegrini: the plaza itself is nothing but there are some fantastic buildings here, particularly the two that are now the Brazilian embassy and the French embassy. Walking down Av Alvear towards Recoleta provides a glimpse of the luxurious life in Buenos Aires. 16. Palermo Parks & Botanical Gardens: very nice green spaces and a decent zoo. 17. Palermo Chico and around: more examples of massive houses. Nice area for walking and looking at the architecture. 18. Museo de Arte Decorativo: not necessarily a great collection by any means but a good opportunity to visit what was once one of the country’s grandest single-family homes in the early 20th century. 19. Palermo Viejo: Many people love this area. It’s not really my favorite but worth a visit. Borges was born here though it surely has absolutely no resemblance to the Palermo of his childhood. Still, it’s worth the visit. 21. Av Corrientes: browsing the many used bookstores on Corrientes in the evening is one of my favorite activities. A crowded street, some decent places to eat, and some very tacky theaters. Zival’s on the corner of Corrientes and Callao is a good place to pick up tango CDs. 22. Av de Mayo: the best architecture in the city. Start at Plaza de Mayo and walk towards Congreso. There’s an entire book that discusses nothing but the architecture of this avenue. Take your time and enjoy the scenery. 23. Xul Solar Museum: My favorite museum in Buenos Aires. MALBA is a close second but there’s something mystical about the watercolors of Xul Solar. He’s not very well-known outside of Argentina but I consider him to be a great artist. The museum is in his former home and is itself an excellent renovation, worth visiting if you have any interest in museum spaces. 25. Mataderos: I don’t think many tourists make it out to Mataderos for the Sunday fair. It’s quite a ways out but for those interested in life in rural Argentina and gauchos then it makes for a nice outing. 26. Clásica y Moderna: a charming, romantic little cafe, dark wood, quaint bookstore in the back, live music in the evenings. Find it at Callao 892. 27. Daytrip to Colonia in Uruguay: board the ferry for the trip to the small, historic Portuguese town of Colonia del Sacramento – a World Heritage site. 28. Estancia: Visit an estancia around San Antonio de Areco, spending the night if possible. I usually recommend El Ombú. When we were there two years ago we practically had the place to ourselves. Depending upon when you visit, you might not be so lucky but it’s still small enough that you should find it very enjoyable. 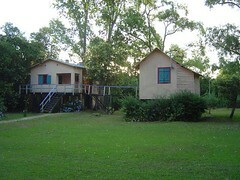 There are also many other estancias located around the pampas. 29. Boedo: one of the barrios in the southern part of the city that doesn’t get much attention. Boedo is particulary important in the history of tango and literature. Several nice restaurants and cafes in the area. 30. 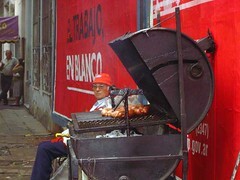 Asado and Parrilla: If you’re lucky and know someone living here, you may get invited to asado at a local’s home. Otherwise, you have to try one of Argentina’s famously huge steaks at a parrilla in the city. Generally, I avoid any restaurant that has a stuffed cow at the front door. The small parillas in the barrios are often better than the fancier restaurants but it’s a hit-or-miss effort. I’ve always had a good bife de chorizo at Chiquilin (Sarmiento 1599), a very traditional restaurant. While I don’t go there anymore ($8 pesos for papa fritas is ridiculous), I still recommend it for tourists with US dollars or Euros to spend. 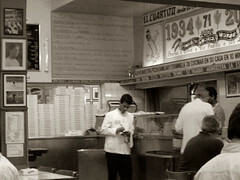 The other night we went to El Cuartito, one of the classic pizzerias in Buenos Aires. There are pizzerias all over the city. This was my first visit to El Cuartito. The place has a great old feel to it. It opened in 1934. It was good but we probably won’t go back soon, just too many other pizza places to try but if you’re in Barrio Norte then El Cuartito is worth a stop. It’s at Talcahuano 937, just look for the large green neon sign out front. Ever since moving to San Telmo I’ve noticed this man every weekday on calle Piedras. He brings the grill and has his own little restaurant on the sidewalk in front of the signs covering an old, abandoned building. Some days he even has a bottle of wine, along with glasses, for his customers who want a drink. Just another one of those unexpected things that you encounter on the streets of Buenos Aires.